The steamer Niagara waits at a pier on Lake Tahoe. Source Caption: It was in the spring of 1875 that the Niagara was launched from Glenbrook. According to Peter Goin in his book LT Maritime History the hull was constructed by Capt. Joseph Todman and was 83 feet in length and a ten foot beam which tells us how wide it was. She did have a problem due to the an under powered engine so she moved at no more than 5 knots or just under 6 MPH. 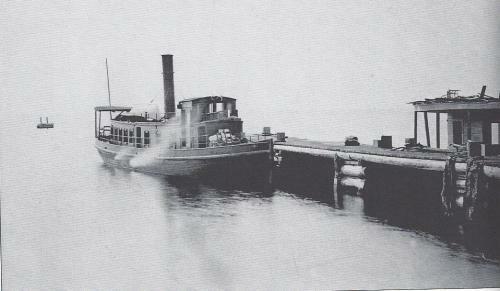 Around 1876 she was purchased by the owners of the Iron Duke, they didn't mind the slow speed probably got it at a bargain price. Bill Bliss photo.